The well-known adage goes something like this: “History is written by the victors.” Whether it was Winston Churchill, Walter Benjamin, or some other thinker who uttered this first, the sentiment remains true regardless. As a historian, I believe that another proverb, “To the victors go the spoils,” relates as well, because, after all, recorded history is one of the greatest gifts that victory has to offer. Similarly, victory and history offer another priceless gift, that of clemency. Winners are not victorious in a vacuum… As Macdonald Carey baritone-ly said in the intro to Days of Our Lives, “Like sands through the hourglass, so are the Days of Our Lives.” Our day, our lives, are a product of not only our personal history but the narrative of history that we collective choose to live through. And that history includes collective victory, as well as collective defeat. History is also an instrument of future policy. Realism views and uses history as a tool of governing and diplomacy. And nothing is more important in realism than the preservation of the state. Bill Bennett’s The Last Best Hope (2006) is a perfect example of using jingoism as a method of history education. Similarly, the Jefferson County School Board debate over the College Board’s Advanced Placement (AP) curriculum too is an example of how history can impact politics and policy. The problem is that war crime adjudication is a product of policy, and not of justice. Victorious powers rarely hold their own actors accountable. The United States, for example, executed Heinrich Hartmann Wirz for war crimes on November 10, 1865. But Wirz, while an American, had committed those war crimes while fighting for the Confederacy against the United States of America. And while William Laws Calley Jr. was convicted of murdering 22 unarmed South Vietnamese civilians in the My Lai Massacre, Calley was released on a technically after only 3 years by US Judge J. Robert Elliott. How does it look to the international community if the world powers do not hold their own actors (leaders and/or soldiers) accountable? There is also the lack of international accountability applied to second fiddle belligerents. Secondary belligerents seem to both escape international accountability as well as avoid responsibility for domestic accountability. While the international community notes the difference between major and minor war criminals, the supposition negates itself if those secondary belligerents do not hold their war criminals accountable. The absence of justice may be a result of domestic disinterest, a lack of international pressure, or the collapse of the nation-state and/or its government. For example, after WWI, Turkish war criminals avoided justice because the Ottoman Empire dissolved, and the new nation-state had no interest in pursuing war criminals. It is almost understandable that the perpetrators of the Armenian Genocide were not held accountable; after all, there was no international apparatus for justice at the time, and the modern Turkish government benefited from the genocide, so there was little domestic interest or pressure. What confuses me is why Italy and Croatia have avoided international justice and accountability for their participation in war crimes and crimes against humanity. After WWII, the Allied governments established the Nuremberg Trials to hold major German war criminals accountable. The United States, as sole legal power in Japan, established the Tokyo Trials to hold major Japanese war criminals accountable. The Italians, second fiddles of Fascism to be sure, captured Benito Mussolini and summarily executed by firing squad. His body was then taken to Milan, where it was hung upside down in Piazzale Loreto, Milan. The British and Americans placed more faith in the post-Mussolini Italian leader Pietro Badoglio’s anti-communism, than the belief in justice for war criminals (including Badoglio himself). The denial of Italian war crimes was backed up by the Italian state, academe, and media, re-inventing Italy as only a victim of the German Nazism and the post-war Foibe massacres. Hans J. Morgenthau, codified the theory of classical realism into six concise principles: 1) politics follows objective rules rooted in human nature; 2) the linchpin of politics is power; 3) power is an objective quantity; 4) there is tension between politics and morality 5) morality is not universal; and 6) politics operates outside of any other concern, like morality. While these six principles represent the core of Morgenthau’s theory, there is an additional important aspect to realism. Realism holds that nation-states exist in a state of anarchy with a ‘balance of power’ among states. Classical realists believe the nation-state to be led by a principal, unitary actor who speaks wholly and solely for the nation-state. To paraphrase Article II, Section I of the U.S. Constitution, the mission of the state (and thus its unitary actor) is to preserve, protect and defend the state. Classical realism makes two more major assumptions: that domestic issues are subordinated to foreign issues and that state always acts rationally (Mingst, 65). As an intellectual construct, the theory of classical realism is sound, but if any of the four parts [anarchy/balance of power system, principal-actor/unitary-actor, acts rationally, and the supremacy of foreign affairs/security] of the theory are undermined, then the entire theory is suspect. As it happens, there are several problems with the theory of classical realism. First, as noted, the theory assumes that the state is led by a unitary actor and ignores internal disputes. In the words of Karen Mingst, it assumes “there are no subnational actors trying to overturn the decision of the government or subvert the interests of the state” (Mingst, 66). Realists believe that any internal squabbling is forgotten in the interests of the nation-state. The theory woefully underestimates internal subnational actors (such as Robert F. Kennedy arguing against the war in Vietnam during the Johnson Administration) and ignores non-state actors (Such as religious leaders, NGOs, etc.). From Napoleon Bonaparte to Enver Pasha, Adolph Hitler and Hideki Tojo something happened to realism’s principal unitary actor. By the time of Slobodan Milošević, limits were put on the power of the leaders of nation-states. What is the balance between the legitimacy of international law and the sovereignty of a nation-state? Traditional realism was best personified by Louis XIV who said “L’etat c’est moi.” From the time of the establishment of the Westphalia System to the Sun King, there was little direct, personal danger as a consequence of one’s conduct of foreign policy. [Indeed, the regicide of Charles II was done at the “be-head-st” of internal struggles, not external conflict.] Look at U.S. President Andrew Jackson. Would the leader of a nation-state today be able to forcibly relocate residents without repercussion in foreign affairs? Jackson’s attitude, which is embodied in the maxim, “To the victors belong the spoils,” is that the president is able to do as he wishes. Even in a constitutionally limited presidency, Jackson thwarted the rule of law (Cherokee v. Georgia) for his own personal desires. The Jacksonian point of view, coupled with Winston Churchill’s worldview (“History is written by the victors”), illustrates a perspective in which there is no higher power to answer to beyond the nation-state. It is not a coincidence then that the only criminal trials were imposed by the existing power; no victorious power subordinated itself to any legal authority. After the American Civil War, it was the victorious North who put Southerners on trial for war crimes at the Andersonville Prison. Yes, the leaders of the French Reign of Terror were put on trial, but it was after they had fallen from political power and were tried by the victorious forces of the Thermidorian Reaction. Over the past hundred years, however, the leaders of nation-states have agreed to international rules of war and humanity. Violators of these conventions have been put on trial by foreign countries as well as international courts. Thus, liberal philosophies, such as Common Security, have made in-roads to repudiating the traditional beliefs in traditional realism. In discussing crimes of war, there are two classifications: “major” war criminals are the leaders of government and high ranking military officials while the enlisted soldiers and low-ranking bureaucrats are referred to as “lesser” war criminals. The most well-known precedents for the treatment of major war criminals are Napoleon Bonaparte’s exile to Elba (1812) and his subsequent imprisonment on St. Helena (1815) as well as Kaiser Wilhelm II’s asylum in the Netherlands (1919) (Willis, 10). The First World War was responsible for creating precedents in the punishment of lesser war criminals as well as the diplomatic and legal process of designating responsibility for crimes and atrocities. The first of such war crimes convictions was the decision of a French military court to execute three Germans who had pillaged (Willis, 13). Notice, however, that a) it was a national, not international court and b) the prosecution was by the victorious French over the defeated Germans. In Britain, the Prime Minister’s Cabinet created the Government Committee on the Treatment by the Enemy of British Prisoners to compile a list of war crimes. It is this committee’s work that not only served as a basis for post-war trials, but also for future war crimes tribunals. Notice again that it is a British committee that is used by the victors to prosecute the defeated Germans. On January 18, 1919, the Commission of the Responsibility of the Authors of the War and the Enforcement of the Penalties was established, and it relied heavily on the British committee’s work. The Commission studied, “questions concerning the origins of the war and the culpability for it, offenses against the laws and customs of war in its conduct, and the constitution of a tribunal to try the accused” war criminals (Willis, 68). In the Treaty of Versailles, the victorious Allies gave themselves the right to punish German war criminals but deferred the trials of 854 Germans to Provisional German Government. These proceeding, known as the Leipzig Trials were considered a failure by the Allies because many Germans were freed or received light sentences (Willis, 113). On the other hand, the precedent was created for trying war criminals and the relative failure of national trials gave greater support for international courts in the future. In another theater of World War I, the Allies had declared their intention to punish Turkish “war criminals” who were responsible for the massacre of Christian Armenians in 1915. For a plethora of reasons, this failed to happen. Most notably, the Ottoman Empire had ceased to exist and there was less demand to punish a new country; similarly, German criminals were left to the Provisional German Government (later the Weimar Republic) that had succeeded the Kaiser’s Imperial Germany. Secondly, the victims of the war crimes were subjects of the Ottoman (and later Turkish) nation-state. Did the international body have the right to punish offending states for the treatment of their own populace? Although unanswered, the question was edging closer to the forefront of international diplomacy. Woodrow Wilson, the American President who spearheaded the Treaty of Versailles strove to answer this and other questions. In fact, one of Wilson’s Fourteen Points in the treaty called for self-determination, the right of national groups to self-rule (Mingst, 36). But what is the limit to national ambitions? What is the limit to the nation-state’s right to preserve itself in the face of national aspirations by sub-national populations? As has been mentioned, the Treaty of Versailles called for collective security and the triumph of international law over national-sovereignty. It left the enforcement of the treaty to the League of Nations. The League, while a failure in its attempt to prevent war, raised the profile of international law. It seems that this is a major dividing point in international relations: there are those who support the growing importance, power, and responsibility of international law and on the other hand, there are those who adhere to the traditional theories of realism that are isolationist and unilateral in nature. Senator Henry Cabot Lodge’s blocking of the Treaty of Versailles used much of the same rhetoric that has been recently used against the International Criminal Court. That is, the “unchecked power” and broad jurisdiction is a threat to American sovereignty (American Journal of International Law, 724). Realism had raised its ugly head once more. 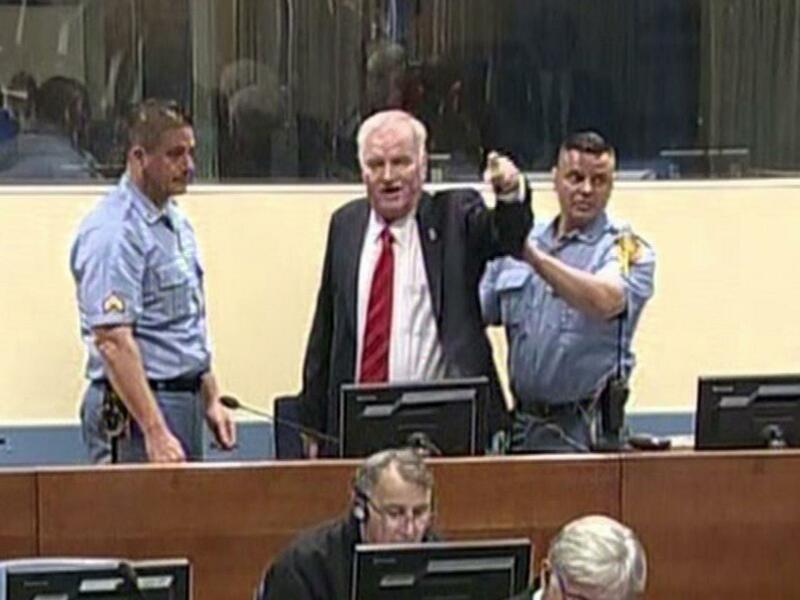 On this past Wednesday, November 22, 2017, Ratko Mladic was sentenced to life imprisonment on 10 counts of genocide, war crimes and crimes against humanity by the International Criminal Court. This sentence, similar to the March 24, 2016, sentence of Radovan Karadžić, was a consequence of their actions during the Siege of Sarajevo and the Srebrenica Massacre. Both Mladić and the Bosnian-Serb political leader Radovan Karadžić (known as the “Butchers of Bosnia”) and were indicted by the ICTY for war crimes during the 1994 Bosnian War. So, more than twenty years later, we can argue whether the pace of international justice truly discourages other international actors. In fact, Slobodan Milošević avoided sentencing through the passage of time (and possibly Russian doctor-assisted suicide). While Milošević made history as the first sitting Head of State to be indicted when he was charged with crimes against humanity in Kosovo in May 1999. This is exactly Realism’s critique and fear of international law: what’s good for the goose is good for the gander. That is, if a Serbian leader can lose sovereign immunity and be indicted by the international community, then so could an American leader. That is essentially the rationale for US withdrawal from the Rome Statute. As mentioned, there is also the lack of international accountability applied to second fiddle belligerents. Secondary belligerents seem to both escape international accountability as well as avoid responsibility for domestic accountability. While the international community notes the difference between major and minor war criminals, the supposition negates itself if those secondary belligerents do not hold their war criminals accountable. The absence of justice may be a result of domestic disinterest, a lack of international pressure, or the collapse of the nation-state and/or its government. The Balkan Wars began Slovenia seceded from the Yugoslav Federation on June 25, 1991. Serbia and Croatia quickly sought, not to reunify Yugoslavia, but to create a Greater Serbia and a Greater Croatia. The primary victim of these landgrabs was the Bosnia-Herzegovina; the Serbs infamously created the Republika Srpska to legitimize their landgrab, but it is lesser well-known that the Croats similarly created the Croatian Republic of Herzeg-Bosnia within the territorial boundaries of Bosnia-Herzegovina. Franjo Tuđman, the President of Croatia, crush Croatian Serbians, supported the Croatian Republic of Herzeg-Bosnia, and on March 25, 1991, Tuđman met with Slobodan Milošević met at Karađorđevo where he may have discussed the partition of Bosnia and Herzegovina between Serbia and Croatia. In 2011, ICC judges found two former Croatian generals guilty of war crimes and that the regime of the late President Franjo Tudjman planned a campaign of systematic violence to empty south-western Croatia of its Serbian minority in order to resettle the region with ethnic Croats. Generals Ante Gotovina and Mladen Markač became scape-goats when found guilty of eight of nine counts for commanding operations that included the shelling of civilians, the torching of Serbian homes in south-west Croatia, the murder of hundreds of elderly Serbs and the forced exodus of at least 20,000 from the Serbian minority rooted in the Dalmatian. However, those convictions were overturned by an ICTY Appeals Panel in November 2012. Tihomir Blaškić, a Croatian general, was indicted on war crimes charges and sentenced to 45 years in prison. In July 2004, ICTY appeal court determined that his command responsibility for most of the charges was non-existent and his sentence was lessened to nine years imprisonment; he was released after four years. Another Croatian general, Ivan Čermak, was acquitted. Still another officer, Mirko Norac, was transferred to Croatia for trial and sentenced to seven years but was released on probation. In the Kordić and Čerkez, the ICC ruled that by April 1993 Croat leadership had a common design or plan conceived and executed to ethnically cleanse Bosniaks from the Lašva Valley. In fact, on December 27, 1991, there was a meeting in Zagreb between President Franjo Tuđman and the Bosnian Croat leadership to discuss the future of Bosnia and Herzegovina formulate an overall Croatian political strategy. Similar to Bosnian-Serb political leader Radovan Karadžić, Dario Kordić was found to be the man behind the ethnic cleansing as the local political Croat leader. Karadžić was sentenced to life in prison, whereas Kordić was sentenced to 25 years but released in June 2014 after having served two-thirds of his sentence. Other Bosnian Croats were also convicted by the ICTY. Jadranko Prlić, the Prime Minister of the pseudo-Croatian Republic of Herzeg-Bosnia, was sentenced to 25 years in prison. The tribunal also convicted five other wartime leaders of the joint trial: defence minister of Herzeg-Bosnia Bruno Stojić (20 years), military officers Slobodan Praljak (20 years) and Milivoj Petković (20 years), military police commander Valentin Ćorić (20 years), and head of prisoner exchanges and detention facilities Berislav Pušić (16 years). No life sentences. So to recap: The Bosnian Serb pollical leader was sentenced to life in prison. The Bosnia Serb military leader was sentenced to life in prison. The Serbian leader died while on trial for his role in the Bosnian Wars (as well as the Kosovo Wars). Conversely, the Bosnian Croat political leader was sentenced to only 25 years, and released in June 2014 after having served two-thirds of his sentence. The Bosnia Croats military leaders were sentenced to 20 years. The Croatian leader was never indicted; Tuđman was re-elected president in 1997 and remained in power until his death in 1999. Interestingly the Croatian government passed a law on cooperation with the ICTY, but since 1997 (Tuđman’s reelection) relations between ICTY and Croatia have worsened. In 1999, Tuđman publicly criticized the work of ICTY and the ICTY Chief Prosecutor Louise Arbour expressed her dissatisfaction with Croatia’s cooperation with the Tribunal. The Split Agreement (a mutual defense agreement between Croatia, the Republic of Bosnia and Herzegovina and the Federation of Bosnia and Herzegovina), as well as Tuđman’s personal relationship with German Foreign Minister Hans-Dietrich Genscher, led the international community to back-off of possible transgressions by Croatia. On December 19, 1991, Iceland and Germany recognized Croatia’s sovereignty and the Split Agreement called on the Croatian Army to intervene militarily on behalf of Bosnia and Herzegovina to relieve the Siege of Bihać. The Split Agreement became a turning point in the Bosnian War, and the international community was primarily interested in ending the regional conflict and, particularly Serbian aggression. As a result, Croatia has benefited the gift of victor’s spoils and entrusted to self-responsibility for war crimes adjudication. No international pressure. Limited international trials for major war criminals. Alleged domestic trials for minor war criminals. Like Turks and Italians before them, the Croats rode the coattails of victory to unaccountability in the interest of international peace and future European Union and NATO partnerships. Mingst, Karen A. (2004). Essentials of International Relations. New York: W.W. Norton. O’Brien, William V. “Just War Theory” in The Conduct of Just and Limited War. New York: Praeger Publishers, 1981. Willis, James F. Prologue to Nuremberg. Westport: Greenwood Press, 1982.